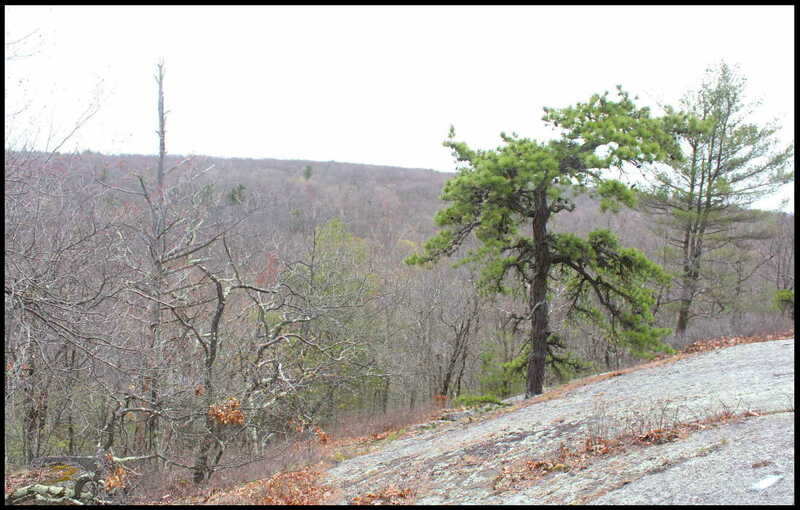 The northern reach of the summit of Red Mountain (1652’ ASL) in Cornwall, NW Connecticut, harbors a pitch pine (Pinus rigida) dominated community on a matrix of exposed bedrock and shallow soils. Such communities are typically associated with habitat with history of fire. Pitch pine forms a stunted to moderate-height, sparse woodland (5–25%) to woodland (25–60%) tree canopy cover in combination with eastern white pine (Pinus strobus) and oaks (Quercus spp.). On the most barren and xeric microsites within the community, scattered bonsai-like pitch pine trees grow to 5’ –15’ feet tall and can exceed 70 years of age. Radial growth of pitch pine is typically less than half that of its hardwood associates. This community is similar to other pine and oak dominated rocky ridge communities in having an abundance of heath shrubs, lichens, and bedrock outcrops. Fire and drought play an important role in the maintenance of pitch pine and other fire-adapted species. Fire-return intervals of less than 50 years tend to perpetuate pitch pine; longer return intervals lead to a more mixed composition, greater overall tree cover, and possible succession to other community types maintained by longer return intervals. Without fire, a greater abundance of fire-intolerant species and tree cover in general is apparent in areas with soil cover. Nonetheless, xeric, barren outcrop areas typically remain open for long periods due to the amount of time required to build up soil. Fire is a rare event at Red Mountain and the pitch pine community appears to be self-perpetuating in its absence, making it quite unusual. A similar ecosystem is found on Mount Everett in the central Berkshires where fire is also absent. That location has been recognized as regionally significant and a place to be afforded the strictest conservation protection (Motzkin, Glenn, et al. “Vegetation and Disturbance History of a Rare Dwarf Pitch Pine Community in Western New England, USA.” Journal of Biogeography, vol. 29, no. 10/11, 2002, pp. 1455–1467., www.jstor.org/stable/827561). The summit pitch pine community of Red Mountain is a prime location for research as well as permanent protection. Characteristic vegetation: Canopy composition includes a variable mix of other trees including Quercus alba (white oak), Q. montana (chestnut oak), Q. velutina (black oak), and Sassafras albidum (sassafras). Quercus rubra (red oak), Pinus strobus (white pine), Betula papyrifera (paper birch), B. populifolia (gray birch), and Acer rubrum (red maple) are commonly mixed in across the summit reach. Shrub cover is moderate (5–40%) and consists of low or dwarf shrubs including Gaylussacia baccata (black huckleberry), Vaccinium angustifolium (lowbush blueberry), Kalmia angustifolia (sheep laurel), Juniperus communis (ground juniper), Gaultheria procumbens (wintergreen), and Amelanchier spp. (shadbush). Herbaceous cover is sparse, but a moderate diversity of grasses and sedges is found with Deschampsia flexuosa (common hairgrass), Pteridium aquilinum (bracken fern), Danthonia spicata (poverty oatgrass), Schizachyrium scoparium (little bluestem), Maianthemum canadense (Canada mayflower), Solidago puberula (downy goldenrod) present in the community. Lichens are common, growing extensively on and around the barren rock outcrops, and include reindeer lichens (Cladonia spp.) which grow under and among heath shrubs.